HUAWEI MediaPad M5 10 Lite Wi-Fi features a brilliant 10.1-inch 1080p display so you will not miss a thing while watching your favourite movies or playing games. For an even better viewing experience, HUAWEI ClariVu technology further enhances display brightness and clarity. 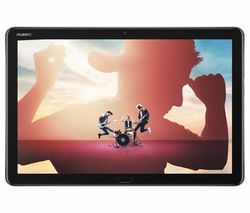 Co-engineered with Harman Kardon, the tablet's quad-speaker system delivers fine-tuned and precisely optimised concert hall audio effects, more bass, and less distortion.